The average contribution of income from game audio to the total yearly income for composers is 40,6%. Sound designers earn 64,2% of their total income from game audio, audio directors 84,2%. Composers have to rely on income from additional sources much more than sound designers or audio directors. Indeed, 42,9% of the participating composers have a “day job” that is not related to audio at all, while only 15,2% of the sound designers have an audio-unrelated income. Only 16,4% of the composers earn 100% of their income with game audio. With 40,6% making money from game audio only, sound designers seem to be more specialised to game audio. Game audio professionals employed at an audio or video game company work in full-time positions: The average work week has 39,4 hours (median: 40 hours). The average salary for employed sound designers was 3,446€ (median: 2,914 €) per month, for audio directors it was 6,392€ (median: 7,294€). There were to few employed composers participating in the study to get a reliable average salary. Employees who also did freelance work on the side earned 6,023€ per year on average (median: 4,290€) from that freelance work. 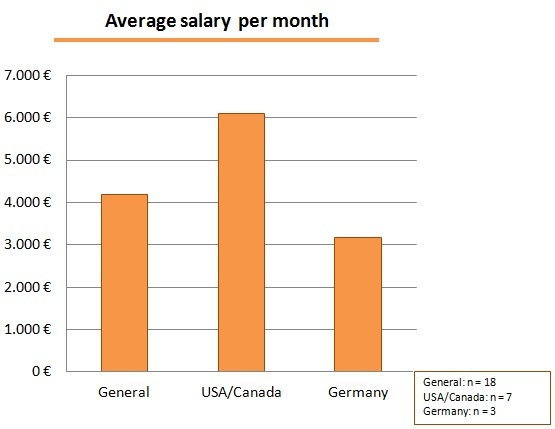 When looking at different regions, it must be noticed that in North America (USA+Canada), the salaries for game audio employees were much higher than in Germany. North American salaries were 6,089€ (median: 6,710€) on average, in Germany 3,183€ (median: 3,400€). The world wide average salary was 4,186€ (median: 3,811€). Please note: because of the low number of participants providing data to this question, these numbers can only indicate tendencies and could not be analysed for each job role separately. Nonetheless, the numbers clearly show that it is not wise for studies and industry guides to provide only a universal, general recommendation for an average salary. The industry experience has no significant influence on the salary per month: At a significance level of 5%, there was no significant correlation between industry experience and real salary per month. The real average yearly freelance income from game audio was 32,659€ (median: 9,000€), taking all participants into account. If all participants earned 100% of their income from game audio, their yearly income would be 66,061€ (median: 33,333€). The real yearly freelance income varies heavily – from 944€ to 189,460€. Composers made an average real yearly freelance income of 34,754€ (median: 8,000€). Just like the salaries for employees, the average real yearly income for freelancers varies tremendously by region: The German average is at 28,750€, while in North America (USA + Canada), the average is at 102,607€. Please note: because of the low number of participants providing data to this question, these numbers can only indicate tendencies. It is very possible that some of the North American participants providing data to this question were very successful professionals with very high income who raised the average for North America to an exceptionally high level. Nonetheless, the tendencies clearly show that freelance income might be much higher in North America than in Germany. 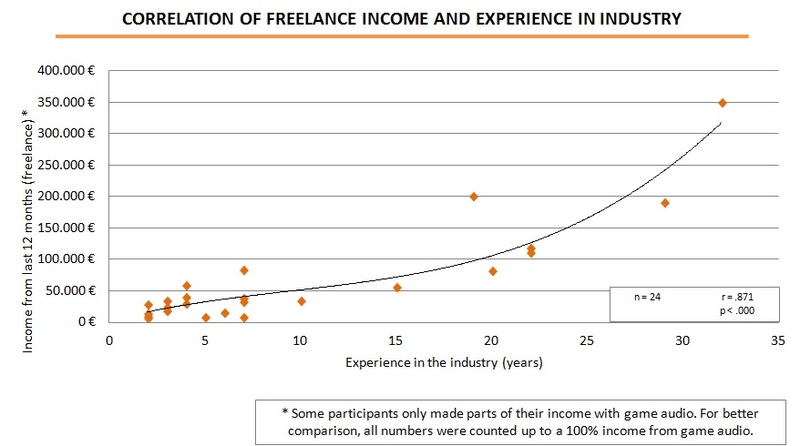 With longer experience in the industry, the freelance income increases significantly. For insights on the audio fees for a project, please request your free PDF copy of the full report now by contacting me directly via yannick[at]gameaudioindustry.com. For insights on how common different types of compensation are in game audio, please request your free PDF copy of the full report now by contacting me directly via yannick[at]gameaudioindustry.com. Research literature and industry guides provide extremely different suggestions for a standard rate per minute of music in the game audio industry. Michael Sweet (Writing Interactive Music for Video Games. A Composer’s Guide, 2015) suggests 1,000$ per minute for experienced composers with good credits, according to Stefan Strötgen (P(l)aying Music and Games. In: Moormann, P. (Ed.) Music and Game. Perspectives on a Popular Alliance, 2013) 1,000$-1,500$ is a realistic per-minute fee. Donald Passmann’s (All You Need to Know About the Music Business, 2012) suggestions are in the same range. Aaron Marks (The Complete Guide to Game Audio (2nd edition), 2009) even suggests 1,500$-2,000$ and more for established composers. Brian Schmidt’s (GameSoundCon Game Audio Industry Survey, 2016) annual industry survey revealed fees of around 100-400$ for indie games, 300-1,000$ for professional casual games and 1,000$-1,750$ for big budget games. The empiric data from this study draw a completely different image of the reality in the industry: the highest rate of all in this study was 947€ (for the last project the participants worked on), thus being lower than most of the suggested rates in literature. The per-minute fees ranged between 33€ and 947€ which is tremendously lower than all other numbers from literature. The average per-minute rate was 452€ (median: 375€). The average rates varied a lot between the different types of game productions. There are also big differences between North America (USA + Canada) and Germany: the average rate for German composers was 391€ (median: 338€), while the average rate in North America was 717€ (median: 758€). All game productions were accumulated here, so maybe the North American composers worked on bigger productions with higher per-minute rates. But the average North American rate still being way higher than the average world-wide rate for big budget productions, it can be concluded that North American rates generally are higher than in other regions. The longer the experience in the game audio industry, the higher is the per-minute rate: there was a significant correlation between years in the industry and the per-minute fee. The level of education and a big number of offered services have no significant influence on the per-minute rate. Important notice: This study was the first time that regional differences in income have been taken into account during the analysis. This is very important because these regional differences are tremendous. Providing only a universal, general number for the average income without taking regional differences into account would have no informative value at all or could even be a dangerous mislead for newcomers to the industry . This study particularly looked at the differences between North America (USA + Canada) and Germany, for which there were a decent number of participants providing information about their income. Future research must investigate regional differences in income in more detail and verify the numbers from this study, as the number of participants providing financial information was very low and the numbers in this study can only indicate tendencies. A separate analysis for each job role would be important to see in future studies with more participants, too.